The folk toy known as the Genie, is reputed to have roots at least as far back as ancient China. One of the sticks is notched with a propeller. 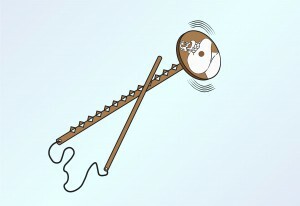 The second stick is rubbed along the notches causing vibration, However, adding a direction to the vibration using one finger will result in the rotation of the propeller. > Vibrations: Friction, rotational vibration and rational motion. Origins of the Genie Stick? > Origins: Is reputed to have roots at least as far back as ancient China.